Remove layers from serviette. Only use top printed layer of serviette. 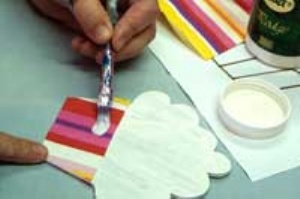 Apply serviette to painted wooden cutout (Only on cupcake section) with Dala podge. Apply with paintbrush over serviette. The serviette is thin, so the podge will soak through, sticking the serviette to the wood. Allow to dry completely. 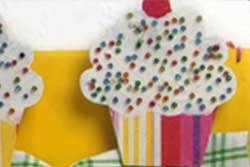 Apply Dala ATP Medium with a spatula to the top of the cupcake cutout to make the "icing". 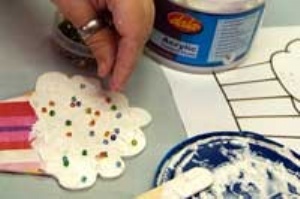 TIP: The Dala ATP medium can be coloured with Dala craft paint, to give your cupcake a coloured "Icing"
While the medium is still wet, small seed beads can be placed in the Dala medium. 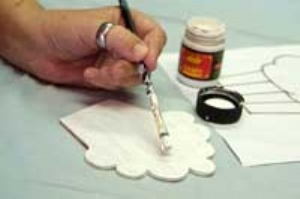 Once dry, the beads will stick in the medium. Shonnah is a multi-skilled crafter and artist. She started with fabric painting 15 years ago, and this love for painting has taken her from a hobby to a home-based industry. Her hand-painted tablecloths have been sold worldwide. 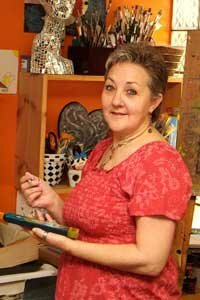 She has presented workshops for Garden & Home, Your Family and regularly presents workshops at Art & Office in Montague Gardens. She has been featured in Craftwise magazine, doing projects for KV ART. She teaches Functional Art as an extra-mural at Elkanah House. She has presented workshops at various other schools. She has also taught crafts as therapy for drug rehabilitation and offers crafts to corporate as a team building exercise. She also teaches from her home, which is a reflection of her personality, very creative and full of colour. There are mosaic works and paintings of hers throughout the house. Wood shapes get cut by Itz van Allez 021 911 0962. This item has 868 views.